Following Azmyth’s departure, Jay, Ben, and Christa pulled Nessa into the Captain’s Quarters in order to tell her that she’d be coming with them to the Final Four. Nessa left the cabin secure in her position, not knowing that the meeting had been a ruse — set up by Jay, of course — to keep Nessa from trying to mount a resistance against them. Sides were chosen for this week’s challenge, and the odds could hardly have been more in the favor of the Captain’s Black Crew. Christa had the help of Ben, Jay, and Laurel to fend off the Red Crew of Nessa, Louie, and Kendra. With only two people to row their boat, the Red Crew fell behind early. But they were able to catch up when the Black Crew incorrectly calculated that 16 pints equals four gallons (the correct answer is two). The Red Crew’s meager lead vanished as Kendra lagged behind on a run through the jungle, and when the teams had to dive into a chilly pond and search underneath a waterfall for a clue, Kendra stayed on shore — leaving her team with half as many people searching for their clue as the other team. Kendra’s reasons: the water was really cold, and she’s not a very good swimmer anyway, so she’d probably just get in her team’s way if she tried to help. For someone who’s always talking about how she doesn’t quit during challenges, it sure looked like quitting. The Black Crew got their lead back by finding the clue first, but, since this is Pirate Master, the final task was a dig-about-randomly-until-you-find-something task. The Red Crew caught up, but Christa found the buried treasure first, retaining her captaincy. Members of the Red Crew each received $10,000. Christa employed the same strategy for assigning Black Spots as she did last week. She let crew members give her names and assigned the Spots to the two most popular suggestions, allowing her to deflect blame for the decision onto the crew. Kendra received her fifth Black Spot, and Nessa received one as well. She went straight to Jay to complain about being back-stabbed by Christa, and he hugged her, knowing full well that he’d insisted that Christa give a Spot to Nessa. At Pirates Court, Kendra gave the same "I’m not a quitter" speech she’s given on four previous occasions. Nessa seemed genuinely flustered that she was up for elimination. She asked the crew to consider whether her strength during challenges was really more dangerous to the them than Kendra’s weakness was. Nessa asked, if she was such a threat, why she had $10,000 fewer than anyone else on the ship. Then she asked Christa, Ben, and Jay if they’d been plotting against her. 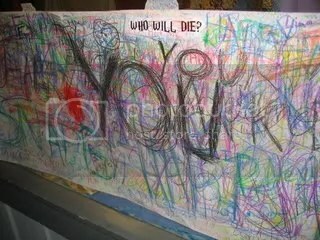 All of them lied, "No." Then she received a unanimous four votes from the crew and was cut adrift. After the crew eliminated Nessa — one of the few entertaining characters left — the preview for the next episode gave me insight into why CBS pulled Pirate Master from the air with only a handful of episodes left. In the preview, Kendra overhears Jay plotting with Ben to take Laurel to the Final Three, and Kendra reports the news to Captain Christa. Based on the preview, I’m pretty confident that Jay doesn’t reach the finale. And a finale in which Jay — the undisputed mastermind of the season — doesn’t have a shot at winning isn’t a finale worth watching. Ben, Louie, Laurel, and Christa are all okay, but they’re not that interesting. And Kendra’s overestimation of the value of not quitting — and underestimation of the value of knowing how to swim on a pirate-themed show — is tiresome, and certainly doesn’t merit $500,000. None of those five deserves to win the show more than Jay, who not only understands the concept better than anyone else, but whose plans have created most of the drama and entertainment throughout the season. Jay not winning Pirate Master is equivalent to dopey, chest-shaving Dr. Sean outwitting Richard Hatch on the first season of Survivor. A Jay-less finale will disappoint and alienate the few fans the show has left. Maybe CBS knows this, and that’s why they pulled the show. This entry was posted in Reality TV and tagged dancing with the stars, dwts on July 31, 2007 by Kathy. In an interview with TV Guide, former Pirate Master captain Azmyth gives his take on why the show didn’t score with viewers: "The television audience just didn’t get to see half of the stuff the producers actually put us through." And, yes, he really believes he’s a wiz at accents. After this Sunday’s season finale, The Simple Life is done — and insiders at E! blame the show’s demise on Nicole Richie’s diva attitude. Speaking of sinking ships, Variety has an article about Katie Couric’s lackluster first year as anchor of CBS’s Evening News. Discovery Channel’s Shark Week 2007 is drawing killer ratings — including an audience of nearly 4 million for the Sunday night premiere of Ocean of Fear: The Worst Shark Attack Ever. For the annual event’s 20th anniversary, Discovery is featuring more than 130 hours of shark-related programming, and I am loving it. If you follow the above link to the article about Shark Week’s ratings, note that Yahoo TV! has filed the post under articles about the CBS lawyer show Shark. Just think of the crossover potential if Discovery could’ve gotten James Woods to narrate some of their shark specials! And if you’re interested in the subject matter of Ocean of Fear — the sinking of the USS Indianapolis during World War II — check out the book In Harm’s Way by Doug Stanton. It’s a gripping account of the days sailors spent in the water at the mercy of sharks, as well as the burden borne by the ship’s captain, Charles McVay. Mary Murphy said in the latest TV Guide backstage report from So You Think You Can Dance that she was surprised that Jamie went home instead of Lauren, even though Lauren’s Hip-Hop routine with Pasha was her favorite performance on Wednesday night. At recent auditions for Rob Mariano’s new reality show Tontine, it was revealed that, in order to participate in the show, the cast will have to put their own life savings into the $10 million prize pot (the network will make up the rest). Additionally, the show will film for 100 days, making me wonder if a 1-in-15 shot at $10 million is really worth the risk of winding up with nothing. Today coanchor Matt Lauer would have no problem coughing up his life savings to take part in Tontine — not with a yearly salary of $12 million, according to TV Guide’s list of Which TV Stars Earn What. The most surprising entry on the list was Judge Judy, who earns a reported $30 million per year from her TV show. I had no idea that networks could make so much money from those daytime commercials for personal injury lawyers and motorized wheelchairs. Finally, more sad news for Pirate Master. The fourth pirate eliminated, Cheryl Kosewicz, was found dead on Friday, apparently having committed suicide. She’d written a variety of blog posts recently about the frustrations of coping with her boyfriend’s suicide last month and the show’s sinking ratings. Fans of the show will have to wait until the next episode of Pirate Master is released online tomorrow to see how CBS addresses Cheryl’s death, as there is currently nothing posted about it on the show’s home page. This entry was posted in Reality TV and tagged dancing with the stars, dwts on July 30, 2007 by Kathy. Dates for the So You Think You Can Dance tour have been announced. The tour kicks off on September 21 in Albany, NY, and tickets go on sale August 11. If you’re in more immediate need of a dance fix, head to Lehi, Utah on Monday for Dancing with Our Utah Stars — an event featuring performances by Dancing with the Stars’ Louis Van Amstel, Julianne Hough, Andrea Hale, and possibly Apolo Anton Ohno. Or, if you can’t make it to Utah, spend Monday celebrating one of the best weeks of the year — Shark Week on the Discovery Channel. Yahoo! TV has a preview of this year’s new shark shows. I’m most excited for Deadly Stripes: Tiger Sharks, which premieres Monday night. The Today Show aired J. K. Rowling’s first interview since the release of Harry Potter and the Deathly Hallows in two parts, yesterday and today. You can watch video of the first part here and the second part here, although you won’t want to if you haven’t finished the book and are still trying to avoid spoilers. I live in Naperville, Illinois, which hosted one of the largest Potter parties in America last Friday. Sixty stores in downtown Naperville participated, and more than 70,000 people attended the event. The Chicago Sun-Times has footage of the party (keep an eye out for the cool "living portraits," who moved to different frames every 30 minutes). The event was organized by the world’s best independent book store, Anderson’s Bookshop, which manages to thrive despite the fact that there’s a Barnes & Noble a few blocks away. The night of the book release, they handed out more than 2,000 copies of the book in less than 1 hour (customers pre-paid, of course). Greg and I were numbers 1427 and 1428 in line, and we got our copies at 12:45 a.m. It was only mildly irritating when the girl in front of us got off her cell phone and announced that her friend had walked into the Jewel grocery store at midnight and picked up one of the 20 copies of the book just sitting on the shelf. 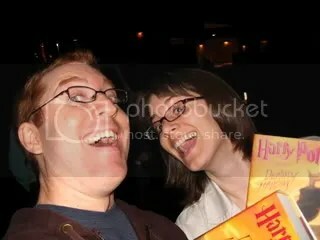 Here are some pics of Greg and me enjoying the Harry Potter related festivities. 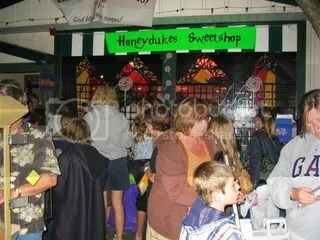 I bought some Cockroach Clusters at "Honeydukes" (better known as Naper Nuts & Sweets). Readers offer some dire predictions about the book. Me, with my new BFFs, Snape and Dumbledore. Greg and I are two satisfied customers. This entry was posted in Reality TV and tagged dancing with the stars, dwts on July 27, 2007 by Kathy. Without Lacey for a partner, Kameron suddenly didn’t look so good — and the viewers told him so. The Results Show began with a super creepy group performance to Imogen Heap’s "The Moment I Said It." The routine was choreographed by Mia Michaels. Mia started the program’s opening comments by apologizing to the U.S. Marine Corps. There was an upside-down Marine Corps emblem on the jacket she wore at the Performance Show, and she hadn’t realized what it was or that it would be offensive. Then Nigel had to apologize on behalf of Wade for last night’s solo routine, because that had apparently offended some people as well. He stressed that being anti-war isn’t unpatriotic: "I don’t know anybody who’s pro-war." He went on about Wade’s routine: "To be frank, I was bored by it by the fifth time I saw it." After that awkward intro, host Cat Deeley trotted out a guest performer, Mika, to kill time. The sound levels during Mika’s performance were so bad that his vocals were unintelligible. Then, it was time to learn the voting results. Jamie and Lauren were told that they were two of the four lowest vote-getters, and they were joined at the bottom by Dominic and Kameron. Cat turned to the judges for their opinion on the Bottom Four, and Mia said she’d expected Pasha to be at the bottom. Nigel’s meager consolation for the dancers: "You’re doing the tour now. [As for the prize], it’s only a quarter of a million dollars." Jamie — Stars, "Your Ex-Lover’s Dead"
Dominic — Jimmy Castor Bunch, "It’s Just Begun"
Lauren — Mercyme, "I Can Only Imagine"
Kameron — Timbaland, "Oh Timbaland"
The girls deserve points for their outfits — Lauren dressed like a jungle girl, and Jamie’s already copious breasts were adorned with beaded fringe. Kameron’s solo was forgettable, but Dominic spent half of his 30-second doing an impressive, continuous spin on his head. Finally, it was time for elimination, and Jamie and Kameron were sent packing. When Kameron’s name was announced, it sounded as if a few of the teen girls in the audience died from shock. This entry was posted in Reality TV and tagged dancing with the stars, dwts on July 26, 2007 by Kathy. While you wait to find out which dancers will be sent home tonight on So You Think You Can Dance, check out these TV Guide interviews with the two dancers eliminated last week: Anya and Hok. I’m very excited that the next season of Top Chef will be filmed in Chicago. I’m going to have to start reading the Chicago Tribune’s Food Section regularly so that I’ll be able to recognize all of the chefs they bring in as guest judges. My excitement about the Top Chef news is diminished somewhat by the news that Veronica Mars creator Rob Thomas has left his position as show runner of the new ABC comedy Miss/Guided. Here are five of the most highly anticipated TV panels at this weekend’s Comic-Con, including a preview of the second season of Heroes and Q&A with the cast. I’ll leave you with a suggestion of what not to watch: Schooled on the CW. The music-themed reality/prank show was filmed at a New Jersey high school, and ends with a performance by the All-American Rejects. Schooled is an advertisement for OfficeMax aimed at middle schoolers. The show, which ran an initial special on ABC Family last year with guest Jesse McCartney, was created by and is entirely funded by OfficeMax. It’s airing on the CW on August 5 — right when most kids are shopping for their back-to-school supplies. What’s even sadder than the mere existence of this show is that it actually works: the company saw an increase in sales after the first special aired. They’re hoping to reach an even bigger audience this time, thanks to the CW. Mia Michaels joined Nigel Lythgoe and Mary Murphy at the judges’ table tonight on So You Think You Can Dance. But their roles are merely ceremonial at this point. The fates of the dancers are entirely in the hands of the viewers. All of the partnerships were new this week, but in addition to the partner dances, each dancer performed a solo — the same solo, as a matter of fact. Wade Robson choreographed a routine to John Mayer’s "Waiting for the World to Change." Wade decided to use the solo as a statement against war. Each of the dancers sported a different harmony-inspiring noun stenciled on their shirt, and the music stopped halfway through the routine so that the dancers could scream their frustrations. The scream stopped any momentum in the performance, and I absolutely hated it. This "same solo" thing didn’t work for me for two reasons. First, all of the dancers danced the solo exactly the same way; Mia criticized them for not making their performances more personal. And second, they saved the judges’ criticism of each routine until the very end of the show, not immediately after each performance. By the time they aired, the critiques had lost any informative value they had for the audience. Since all of the solos looked basically identical to me, I’ve just included one of Nigel’s comments for each soloist. The solos are numbered based on the last two digits of each dancer’s voting call-in numbers, and the word following the dancer’s name is what was written on his or her shirt. Shane didn’t know if Pasha would be able "to hang," but he did a really good job with Shane’s "human transformers" routine — especially since Pasha’s totally un-gangsta. The performance was well-received by the judges. Nigel called Pasha "the best Russian hip-hop dancer I’ve ever seen." And Mary hollered, "Nigel, I’ve got a fever tonight. And the only prescription is more Pasha & Lauren!" "Some of your technique is lacking." Song: Crystal Lewis, "Amazing Grace"
While these two seem fond of each other, Sabra totally outshone Kameron. For his sake, he’d better hope this is a brief partnership. "I don’t see the magic between the two of you," said Mary, who went on to call Sabra "pure perfection." Mia told Kameron, "I feel like you’ve been exposed tonight," and called his technique "immature." "You need to make your dancing bigger than you are." "You’re out of your league." Song: Club Des Belugas, "Hip Hip Chin Chin"
I love this song! Totally hot performance. Nigel reminded Lacey, "Use Danny as a partner." Mary said Danny’s performance "wasn’t my favorite tonight" because of his technique. Lacey, on the other hand, was "fabulous." Mia called the performance "the sexiest dance this season." "You showed me how well the music works." "Every time you bring your arms forward, it looks ugly." "You are small, but you dance so large." Song: Linda Eder, "Man of La Mancha"
Dominic was excited about the chance to "manhandle" Jamie in this Spanish-influenced waltz. Nigel thought the song was more appropriate for a Paso Doble instead of a Viennese Waltz, and he thought Dominic overacted it: "It didn’t work for me at all on any level." Mia warned Jamie to stop opening her mouth so much. "You were like honey dripping out of a bottle. You were so smooth." Song: Rachel Stevens, "Knock on Wood"
Great lifts and tricks, plus some super corny outfits. Totally fun. "I love disco," cooed Nigel. "It was terrific. You entertained everybody here." Mia said, "You guys are, like, the biggest dorks — in the best possible way." My favorite dances were Sara & Neil’s Disco and Lacey & Danny’s Samba, and I think I’ll throw my vote to Sara tonight. Tomorrow night, the boy and girl with the lowest number of votes will be sent home, without any intervention from the judges. Based on tonight’s performances, Jamie and Dominic should be in the most danger. Jamie could be toast, but I suspect that Dominic’s earned enough goodwill to stick around. My guess is that Kameron goes home, instead. This entry was posted in Reality TV and tagged dancing with the stars, dwts on July 25, 2007 by Kathy.